Page 19 of The Mythic Roots of Western Culture’s Alienation from Nature. Adams and Belasco. Tapestry Institute Occasional Papers, Volume 1, Number 3. July, 2015. Outline / List of Headings available here. Reproduction of Figure 4 from page 15. As we have seen, humana and humanus perceive nature in opposite and mutually exclusive ways, so importing either to the other’s landscape destroys it. Simply reintegrating humana and humanus to reconstruct the unsplit psyche is therefore not a viable option for restoring wholeness. If we look at the schematic diagram that represents splitting of the psyche into humanus and humana in the Tigris and Euphrates valleys 4000 years ago (Figure 4, reproduced above right), it might look like “going backwards” could restore the nana moma in a neutral landscape that’s neither Ruthless nor Idyllic nature. But notice the “pre-split” state of the psyche is simply labeled “whole human being” on that diagram — not “nana moma.” This is intentional. 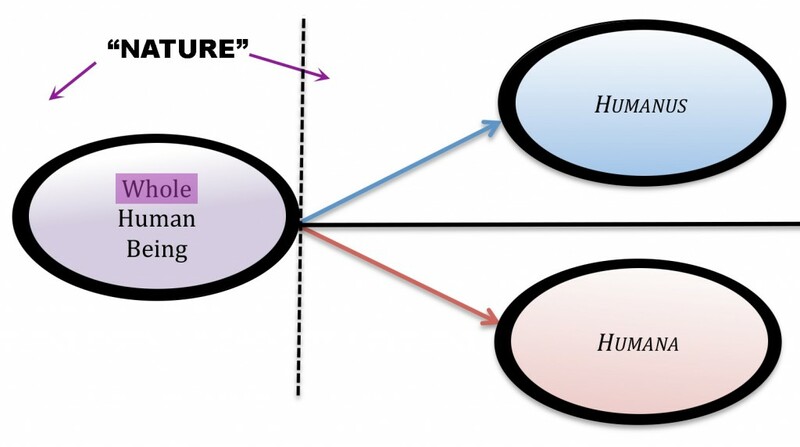 The same diagram has been reproduced in Figure 7, but in a way that accentuates a key feature we haven’t discussed yet: the boundary around the parts of the human psyche represented by each of the three shapes. Those heavy boundaries separate the human inside from the natural world outside. They mark a separation of humans from nature that constitutes an additional splitting event in the human psyche. This split, a very deep cut that separated human beings from nature itself, took place at the same time as or just before the event that split the now-isolated human psyche into humanus and humana. The deep separation between humans and nature caused by that primary splitting event is what’s represented by the heavy lines around each shape in Figure 7 (87). Those lines are the walls of Uruk. Figure 7. This redrawn version of Figure 4 emphasizes the boundaries around the shapes that represent parts of the human psyche. Inside each boundary is “human” and outside each boundary is “nature.” They are separated from one another. This is why walls are such an important element of the Dark Forest, Fiery Desert Myth. The only reason the cabin, headquarters, trading post, and castle walls seemed subtle when we first saw them in Lawrence of Arabia, Silverado, and Monty Python and the Holy Grail is that walls are such a primal part of Western culture’s view of the relationship between humans and nature. It’s nearly impossible for the conscious mind of contemporary people to see them now. Yet in each case, the walls in these films were placed in parts of the stories that very clearly signaled a major change in the psychic, as well as geographic, landscape. And the audience, watching, understood perfectly well what it meant in terms of changes in the types of challenges the Hero would encounter (88). So what could the area on the left, pre-split side of the diagram look like in order to depict the nana moma? If something as innocuous as an oval shape with a boundary around it actually depicts an important aspect of contemporary Western psyche, how can we envision and represent something that is fundamentally part of the “landscape” it occupies? These statements accord well with expressions found in writings by people such as John Muir, Aldo Leopold, and Edward Abbey, who are clearly part of the dominant culture but struggle with its existing motifs of human-nature relationship. What all these writings have in common, visible in the premises we discovered in Little’s work, is a perception of nature as numinous: something strongly spiritual (91). The view of nature as numinous is not transcendent, but deeply rooted in the material world. The physical presence of the great Douglas fir was an essential part of Little’s experience, which is why it cannot be fully replicated or transferred through his words alone. At the same time, his experience was not merely the sum of that tree’s trunk, wood, bark, branches, and needles; it could not be reduced to the tree’s constituent parts. The sacredness or numinous quality of nature is an emergent property: one that arises from interactions and relationships between all the constituent parts – which in this case includes Little himself as well as the tree. It is the perception of nature as sacred or numinous that generates a sense of awe and wonder in human beings. The nana moma is therefore a manifestation of relationship, rather than just appreciation of the material aspects of nature by objective (separated) human beings. That is not the ‘nature’ Indians understand. Indians never made any of those divisions. . . As Indians look out at the environment and as Indians experience a living universe, relationships become the dominating theme of life and the dominating motif for whatever technological or quasi-scientific approach Indian people have to the land. Indians do not simply learn survival skills or different ways to shape human utensils out of other natural things. In shaping those things, people have the responsibility to help complete their life cycles as part of the universe in the same way they are helping people. Human beings are not above nature or above the rest of the world. Every species needs to give to every other species in order to make up a universe. . . It is a cooperative need to engage in joint enterprises. Notice the emphasis on relationship in Deloria’s description of nature and the ways people interact with it. As Cree scholar Shawn Wilson points out, “Relationship is a living process,” so Indigenous cultural relationships with nature focus on processes rather than material objects (93). These processes include knowledge transfer through things such as intuition, dream, art, story, music, and kinesthetic experience as well as logic, analysis, and other cognitive processes. 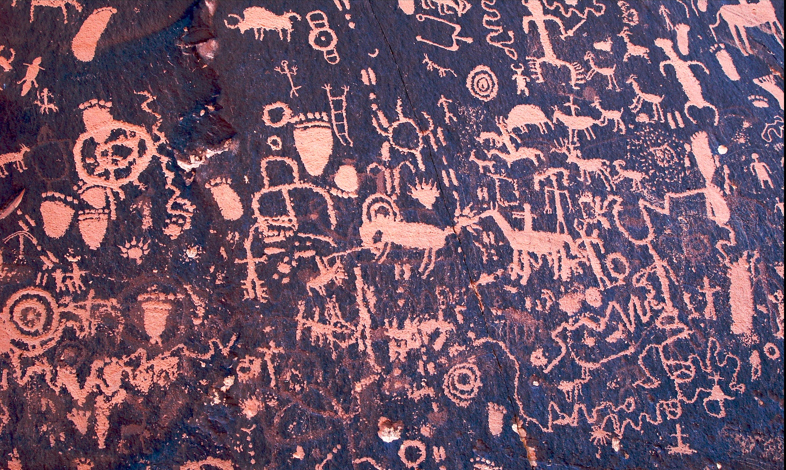 Petroglyphs at a Utah site that’s called “Newspaper Rock” by people of the dominant culture. Images have been added to the site for over 1500 years, by Puebloan and contemporary Ute peoples. Its apparently chaotic layout depicts the nana moma‘s view of “everything” — including human beings. 87. Within the Idyllic view of nature, people operating from a psyche that perceives the human-nature relationship in a Best Friends motif don’t seem to have a boundary between themselves and animals (or, sometimes, plants). So it may look like the Best Friends motif is different from the other three and might represent a “relict population” psyche that predates the separation of humans from nature. But the Best Friends motif is a fantasy: birds don’t tie ribbons in peoples’ hair in real life, and mice don’t sew people dresses. The motif plays out disastrously in the real world when, for example, people try to pet wild buffalo and accidentally get gored. In point of fact, the Best Friends motif reflects a fundamental lack of familiarity with the real natural world. It is only possible in people already deeply separated from nature. The motif manifests a fantasy of re-established wholeness rather than genuine or intimate relationship with nature. 88. Walls exist in other cultures, too, and there are many different kinds of walls. Our discussion of walls in the Dark Forest, Fiery Desert Myth and their meaning in the context of understanding the humanus is not universal but specific. 89. Clarissa Pinkola Estes. 1992. Women Who Run With the Wolves: Myths and Stories of the Wild Woman Archetype. Ballantine Books, New York. page 5. 90. Charles E. Little. 1995. The Dying of the Trees: The Pandemic in America’s Forests. Penguin Books, New York. pages 192-193. Discussion of the passage referred to is on page 17. 91. A numinous quality does not necessarily suggest the presence of a divine being but tends to do so to people with a theistic view of religion. A discussion of theology and the relationship between theism and a perception of numinosity lies outside the scope of this paper. For now, what’s important is to realize that perception of numinosity or the sacred does not automatically imply the existence of a divine being. 92. Vine Deloria, Jr. 1999. Spirit & Reason: The Vine Deloria, Jr., Reader. Edited by Barbara Deloria, Kristin Foehner, and Sam Scinta. Fulcrum Publishing Co., Golden, CO. page 227. 93. Dawn Hill Adams, Shawn Wilson, Ryan Heavy Head and Edmund W. Gordon. 2015. Ceremony at a Boundary fire: a story of Indigenist Knowledge. Longmont, CO; http://hdl.handle.net/2123/13689, page 21.